feels as inevitable as it is well-deserved. On February 1st, Mandolin Orange celebrated the release of its sixth album, Tides Of A Teardrop, in front of a sold-out audience at the 2,700-capacity Durham Performing Arts Center. From there, the band—led by Andrew Marlin and Emily Frantz—kicked off a string of sold-out shows up and down the East Coast. By any measure, the Chapel Hill–bred duo is one of the regional music scene’s greatest success stories, with a steady ascendance that echoes the “one-fan-at-a-time” ethos that brought Concord’s Avett brothers to national stardom. And, like the Avett Brothers, Mandolin Orange has carved a niche for itself within the broad Americana genre, fusing traditions of folk, bluegrass, and classic country with carefully crafted songwriting that muses on daily struggles and also tackles bigger, more philosophical issues—often within the same song. Take, for instance, Tides of a Teardrop’s lead single, “Time We Made Time.” Here, against plaintive guitar chords and a weeping fiddle, Marlin’s pleading tenor offers a bit of simple profundity in the song’s chorus. “It’s time we made time just for talkin’,” he sings. “It’s time we made time to heal.” The song’s climax reaches a smoldering crescendo with avant-jazz percussion adding more texture than pulse to the swell of the song. 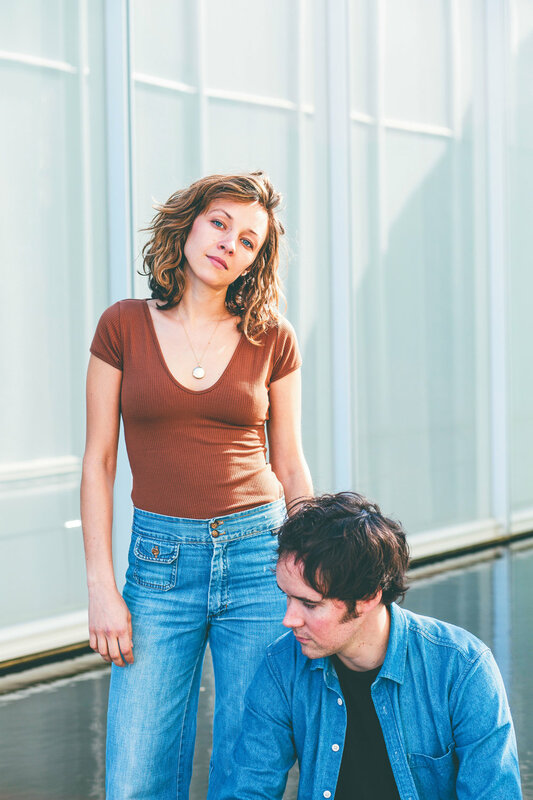 MANDOLIN ORANGE, LED BY THE CHAPEL HILL–BRED DUO OF ANDREW MARLIN AND EMILY FRANTZ, IS CARVING A NICHE FOR ITSELF IN THE AMERICANA GENRE. Indeed, as much as Mandolin Orange embraces the traditional music that inspires their own, they’ve never been beholden to orthodoxy of any stripe. Marlin and Frantz met in 2009 at a bluegrass jam session in Carrboro, hit it off, and started a band. And as their band blossomed, growing from a low-key acoustic duo into a growing concern on local, regional, and national stages, their sound grew as well. Still, they never sacrificed the understated and easygoing nature of their earliest efforts together. Even as they’ve tackled heady themes in their songs—such as questioning religious tenets and affirming gay rights on 2013’s This Side of Jordan or mourning the Sandy Hook shooting on 2015’s Such Jubilee—they’ve managed to do so in a contemplative manner, offering more questions than answers, and leaning into a Golden Rule morality that feels both understated and free of judgment. And the pair is just as likely to steer into a rollicking road song, like “Old Times and Companions” from Such Jubilee or “Hard Travelin’” from 2016’s Blindfaller. Musically, they’re just as prone to ramble. From quiet folk to bluegrass breakdowns, from upbeat Americana to searing honky-tonk, the band has never let tradition become a rut. From the experiments with electric embellishment that began with 2011’s Haste Make/Hard Hearted Stranger, to the full-band arrangements that buoy their studio recordings and stage performances, Mandolin Orange has always built beyond the confines of its core duo. And yet, the casual intimacy that marks the warm harmonies and earnest songwriting of Marlin and Frantz has never suffered for it. That they’re so often willing to peel back their own experiences to fuel thoughtful, meditative songcraft certainly helps with that sense of intimacy, as well. On Tides of A Teardrop, the duo wrestles explicitly with grief. On “Golden Embers,” Marlin sings about losing his mother when he was 18, and the strain that grief put on his relationship with his father. On “Into the Sun,” Frantz reminisces about her grandfather, his love for driving, and his stories. of his personality is wrapped up in that song.” These sorts of familial meditations are given an extra bit of gravitas when you consider that Marlin and Frantz, an off-stage couple as well, greeted their firstborn daughter late last year. It feels safe to say that becoming parents likely inspired some of the duo’s reminiscences and contemplations of their own forebears. Still, no matter what themes find their way into Mandolin Orange’s songs, the real draw is always the craftsmanship put into making them. There’s a classic chemistry in Marlin and Frantz’s vocal harmonies that has earned frequent comparisons to Gram Parsons and Emmylou Harris. On country-leaning songs like “Lonely All the Time” and “When She’s Feeling Blue,” Marlin strikes a countrypolitan swing and lyrical wit that suggests the likes of George Jones. And the gentle, lilting waltz of “Mother Deer” feels timeless in its simplicity, like a folk standard only just discovered. And ultimately, perhaps it’s that sense of familiarity and craftsmanship that has made Mandolin Orange’s ascent feel so inevitable. Of course they’ve found an audience; how could these songs not be heard and enjoyed?